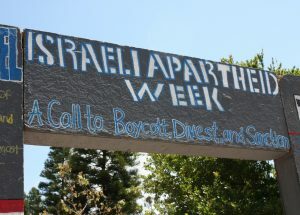 raeli Apartheid Week, the annual international anti-Israel showcase, in May 2010 on the University of California, Irvine campus, photo credit AMCHA Initiative. EXECUTIVE SUMMARY: In the campus war against Israel, the all too familiar refrain from student anti-Israel activists, many of whom form the loose coalition of groups and individuals spearheading the Boycott, Divestment, and Sanctions (BDS) campaign, is that their quarrel is only with Israel and its government’s policies, not with Jews themselves. But that specious defense continues to fall away, revealing base anti-Semitism. This represents a seismic shift. Jews are now being indicted not just for supporting Israel but for being Jewish.